So, Chef Isaac Toups, how’s it going? Um, no. They don’t, actually. That’s insane. And they certainly don’t do all that on their off-days – a phrase that’s detoured far away from its dictionary definition ever since Toups and his better half, Amanda, opened Toups Meatery in Mid-City New Orleans in the spring of 2012. Powered by Toups’ equally refined and lovably crass tongue, Toups Meatery has garnered critical acclaim for its inventive menu filled with items affordable enough for you to still ask that pretty girl out to the movies. The entrees are sophisticated but familiar. The menu can fit on a postcard, but there’s something on it for every taste. The items are easy to pronounce. Fancy attire is certainly welcomed, but flip-flops and a gravy-stained T-shirt are cool, too. 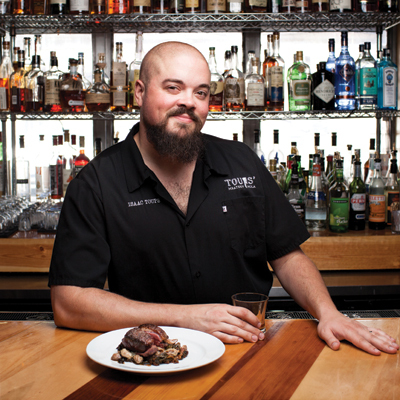 It’s about the food, here – a message echoed in Toups’ laid-back demeanor. As the self-titled “chef/owner/janitor/bouncer” of the restaurant, Toups works the anti-thesis of bankers’ hours, which isn’t foreign. It’s been like this for years everywhere he’s worked, he claims, from messing up plates during his cooking infancy at Prejean’s in Lafayette to perfecting his craft and embracing the fact that food is an art form at Emeril’s Delmonico in New Orleans. Named the 2010 Chef To Watch by The Times-Picayune, traces of Toups’ Acadiana roots are evident in almost everything he does. He calls Toups Meatery a contemporary Cajun restaurant, a purposefully thought-out designation preventing Toups from painting himself into a corner when he occasionally colors outside the lines with the menu. He was born and raised – or “born and braised,” as he likes to say – on 20 acres in a small town with little else to do but find innocent trouble. The Toups family stressed the somewhat conflicting virtues of self-reliance and community. Toups’ father, more intimidating than most, taught his son a love for a wide variety of foods by literally holding his ear until he tried something new at the family-reunion buffet. “Gotta thank him for that,” Toups says. Toups recalls asking his mother for breakfast one morning. How old was he? Toups can’t pinpoint an age, but he couldn’t reach the stove top on flat feet, so he was definitely young. Mom grabbed a skillet, turned on the burner, and said, “Cook yourself some eggs,” Toups recalls. Though he’s never verified it, Toups guesses his mother thought he’d walk off instead of honching up on his tip-toes. Friends called up, asking Toups to do normal boy things. Hey, let’s ride bikes. Hey, let’s go play ball. And Toups would, but only after the then-12 year old finished putting a beef wellington in the oven. Afterward, everyone came over to eat. He does the same today in his humble Gentilly residence, entertaining friends and roasting the pigs – both literally and figuratively – enjoying the few spare moments afforded in a budding culinary career. Toups’ Cajun microwave is severely overworked, as any excuse is good enough to invite some people over.